To begin, what are abusive relationships? Certainly, the answer is relative and depends on the way we individually develop our personal standards. Culture also has a lot to do with what is regarded as abusive and what is not. In this article, I share a generalized view of the different and common forms of abuse, and the reasons we stay in abusive relationships. What are the different forms of abuse? The list below includes some common forms of abuse although it is not exhaustive of what abuse can be. When someone says a lie about you, they have abused your persona. They are probably jealous of you or just want to make themselves feel good by putting you down. Another reason why people lie about others is that they want all the attention to be directed at them. For the most part, they are insecure and don’t really feel good about themselves. They believe that by lying about you, others will turn their attention away from their weaknesses and focus on yours. When someone repeatedly lies to you, they firstly do not respect themselves, and the same goes for you or anyone else. Remember, we generally treat others the way we treat ourselves. Most importantly, someone lying to you is a form of abuse. They abuse your intellect by lying. This is self-explanatory. When someone insults you by either calling you rude names, making negative comments about your self-image, your intellect, or criticizing the way you do things, they are abusing you. I appreciate that at times someone might say negative things to you because they are going through their own drama and aren’t nice to anyone especially to themselves. But if one insults you more than once they have abusive tendencies. We believe it is normal to judge and/or criticize others. But this is not only wrong but also implies that we are investing our focus on something that doesn’t, and will never promote us. We normally judge others based on what we’ve either been told about them, subconscious bias–if they are different from us, or if they intimidate us. We find a way to judge them–which means making conclusions about them without enough evidence. People are also so accustomed to criticizing others and constantly identifying what they believe is wrong with them. This turns into abuse if one is doing it often and doesn’t change even when you bring it to their attention. Physical abuse is when someone hits, pushes or engages in any forceful physical activity that causes you discomfort or bodily pain. Note that one time is more than enough times for you to walk away—and trust me on this one. Why do we Stay in Abusive Relationships? In this video, I share 6 reasons that I believe you will relate to. I also share a simple yet powerful tip that will help you get out of any abusive relationship. Firstly, thanks for visiting my blog. Please follow me so that you get periodical blogs on personal development and inspiration. When you click on the referenced video, please subscribe to my YouTube channel, share and like the video. If you have comments, even better. Please include them in the comments section below. Looking for a powerful life-changing self-help book to read? I got you. Click on this link to order your copy. Dr. Jacinta Mpalyenkana, Ph.D, MBA, is a published author, transformational coach, counselor and professional speaker. For more about her, please visit her website at http://www.tapthgood.com. Does your past often haunt you? Do you often feel validated to think negatively? Does your mind ramble on and on about a negative past experience? Well, regardless of what happened to you in the past, it’s always the right time to let it go. Letting go of our negative stories only benefits us. When we let go of negative self-talk however validated we might feel, we create space in our minds to focus on more positive empowering stories. Remember, we deserve to feel good all the time no matter what. In this EFT session, I help you to let go of any negative story that could be running at the back of your mind. Please share with those who might benefit from this session. Although there are many reasons that incite our frustrations, the main reasons are founded on two major factors: money and relationships. We get frustrated because we either don’t have money, we are losing money or money is not coming in as expected. We also get frustrated because of the people we deal with: especially because we are all different and view the world from a diverse perspective. One thing I have learned is that the factors that promote our negative emotions, plus the negative emotions are not as crucial in influencing our emotional well-being as our perception about them. As such, my intention is to share 10 tips that you can use to get out of a frustrated mood regardless of the foundation of your frustrations. Remember, it is not what happens to us that impacts our lives; it’s how we perceive whatever happens. By moving, I mean, changing your physicality. Do yoga, dance, go for a walk, exercise: the idea is to get your body moving. Once your body is moving, your brain will change its focus from the frustration to whatever you are doing. Note that emotion is created by motion. In other words, emotions are linked to movement in our bodies. Observe your posture when you are happy, as opposed to when you are sad — or what you look like when you are angry, versus when you are elated. Listen To Inspirational Or Upbeat Music. Note that it is important to spend time making your own list. Cleaning your space has a magical way of making you feel better. As you clean, your mind goes into the cleaning mood. As such, you implicitly clean the frustration from your mind. Imagine receiving $1 Million in your bank account; make a list of how you would spend it. Just go into your kitchen and concoct recipes regardless of what you are cooking. The process will definitely help you divert your mind from the frustration. Change your furniture around. Don’t try to be perfect. Just change things around in whichever way you want. This will help you realize how blessed you are. Just make plans without worrying about the resources required to realize them. Make plans as you focus on the things you want to manifest in your life—imagining that there are no obstacles that can hinder you from achieving your goals. Remember that the difference between where you are emotionally or mentally, and where you want to be, is only a decision away. Once you decide to change your mind about anything, you have literally embarked on a profound journey of getting to your desired destination. Are you sick and tired of attracting abusive men? You might have daddy issues. Read on!! It is not only biologically vital but also spiritually imperative to grow up with our parents, mom and dad, or the equivalent, for us to develop and sustain positive-infused mindsets. Although overlooked, without both your parents in the picture as a child, you are bound to search for whoever was missing in the people you meet in your adult life. And that can be very frustrating. Note that one is also impliedly psychologically and emotionally abused if their father or father figure was always absent in their younger days. In this article, you will identify one of the problems created by not having a father figure or having an abusive one, and learn three simple techniques that will liberate you from this problem in order to develop healthier relationships with the men in your life. Without a father figure in your life, you miss out on the security and comfort that a father figure provides (especially one with a healthy mind). A father is literally the first adult male you are introduced to, or is supposed to be introduced to when you are born. As such, he represents men in general and especially how men relate or should relate to women. Your father introduces you to the first standards that you believe every man should possess. If you saw your father treating your mom with respect, you tend to attract or choose men who understand how to treat a woman with respect. If especially you witnessed your father abusing you or any other members of your family and never stopped abusing them, and/or never apologized, chances are that you have subconscious anger that’s not only directed towards your father, but all men. The consequences are that you will continue unconsciously seeking out men with behaviors similar to your dad with hope that they might abuse you and then apologize to make up for what your father didn’t do. However, even if you attract men who are apologetic for abusing you, they will not compensate for your father’s abuse. Therefore, you will continue seeking for abusive men, over and over again until you deal with your early father-figure programming. Note that the tips I share below are not exhaustive of all the techniques and tools that you can employ to heal your early negative father-programming. What did your father do, didn’t do, or should have done? In case you didn’t have a father figure as a child, how did this make you feel? How did those experiences make you feel about your father and men in general? How did these experiences make you feel about yourself? Or sign up for my complimentary 30 minutes consultation session to set up counseling sessions that are guaranteed to help you take your power back from the negative past in order to live life on your terms. Dr. Jacinta Mpa, Ph.D., MBA, is a published author, counselor and transformational coach. For more about her, visit www.tapthegood.com. Do You Feel Hated? Check this out!!! Do you feel isolated and rejected? Do experiences of rejection, isolation and loneliness continue to show up in your world? Do you feel stuck and have no idea what to do? Well, my friend, the answers are right there within you. The challenge is to get yourself out of the way, and find these answers. That’s why we all need someone professional to help us face ourselves without fear or judgment. Check out this video. Please leave comments and subscribe to our YouTube channel to receive self-mastery and self-healing tips, as they are uploaded. In the interim, don’t forget to register for our upcoming seminar, scheduled for 02/10/2018, in Los Angeles, California. 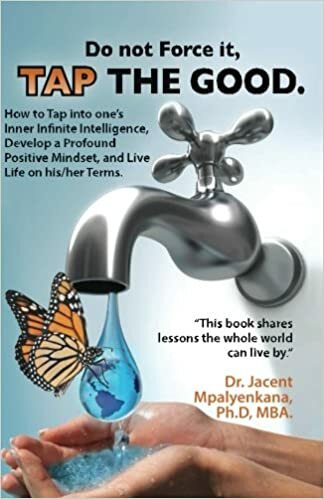 Check out http://www.tapthegood.com to discover counseling and coaching services by Jacinta, to help you meet yourself, connect to the abundant resources within you, and live life on your terms. Let me help you! !